^ "AMA Facts & Figures". 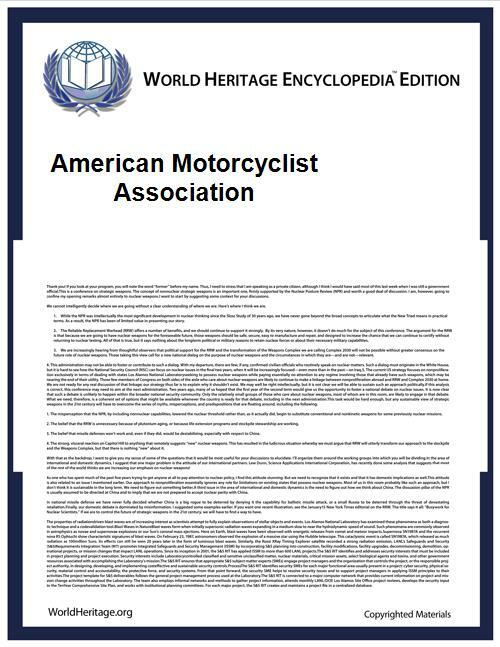 American Motorcyclist Association. 2014-04-30. Retrieved 2014-10-28. ^ "AMA Sells AMA Pro Racing To Daytona Motorsports Group". SuperbikePlanet.com. Retrieved 2008-03-08. ^ "AMA & Daytona Motorsports Group Press Conference Transcript". SuperbikePlanet.com. Retrieved 2008-03-08. ^ "Expletive Deleted: 2009--Last Year of the Factories?". Superbike Planet. Retrieved 2009-07-11. On March 7, 2008, the AMA Pro Racing series was sold to the Daytona Motorsports Group (DMG), headed by Roger Edmondson and Jim France. The DMG will be responsible for the AMA Superbike Series, the AMA Motocross Series, the AMA Flat Track Series, the AMA Supermoto Series, the AMA Hillclimb Series and ATV Pro Racing. The sale did not include the AMA Supercross and AMA Arenacross Series, whose rights are currently owned by Live Nation. DMG will license the AMA name and trademarks to promote the motorcycle racing series. The new management has sparked criticism among some of the press and fans for allegedly alienating the factory teams  and for introducing NASCAR style rules such as rolling start and pace car. AMA Pro Racing was formed in 1994 to respond to the growth of motorcycle racing in United States and holds many events. The AMA Road Racing Series includes the AMA American Superbike Championship, the AMA Daytona Sportbike Championship (which incorporates the former AMA Supersport Championship and the now inactive AMA Formula Xtreme), and the new AMA Supersport Championship, which is limited to riders of age 16-21 on near stock 600cc motorcycles. Other series include AMA Supercross, AMA Motocross Championship, AMA Grand National Championship dirt-track series and AMA Hillclimb.